Prepare for an early morning pickup at your San Jose hotel to make the most of this jam-packed day. Stop for breakfast en rout to the nearby city of Cartago, home to interesting ruins of a destroyed church and other remnants of a 16th-century colonial settlement. Hear the legends that surround the crumbling chapel before continuing north to Irazú Volcano National Park. Peer down into the active volcano’s lagoon-filled crater, and enjoy commanding views from the top of the peak. On a clear day, you may be able to catch sight of both the Pacific and Atlantic oceans from the 11,260-foot (3,432-meter) summit. Next, travel to the riverside town of Puerto Viejo de Sarapiquí and board a covered river boat for a leisurely 2-hour cruise down the Sarapiquí River. Keep a sharp eye out for sightings of local wildlife that inhabits the surrounding jungle, such as crocodiles, monkeys, sloths, and toucans. The voyage concludes at a private farm, where you can stretch your legs on hiking trails and enjoy a homestyle Costa Rican lunch. Pass through the beautiful Braulio Carrillo National Park on the return drive to San Jose, where the 12-hour tour concludes with hotel drop-off in the evening. I loved this tour. Our tour guide Mario was very helpful. The day we went had clear skies and we were able to see the Volcano and crater super clear. I enjoyed the river tour as well. Got to see an aligator. A lot of driving but worth it in the end. This tour was great. Our guide Eugenio was excellent and provided a lot of insight to everything we saw. 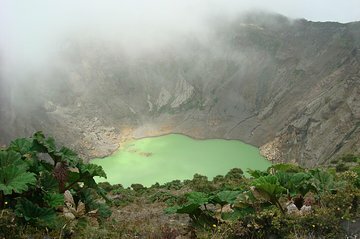 Irazu was beautiful and there is something fun about standing in a volcano crater while viewing other craters. The Cartago ruins were by far the oldest thing I saw while in Costa Rica. One thing that did not occur on this tour was the Sarapiqui River Tour. I am not sure why but changes to plans is something that occurs quite often in Costa Rica. They did however replace this portion of the tour with a beautiful lunch on a lake. Overall, I highly recommend this tour but be flexible. Good service. Good tour. Unfortunately, the day was cloudy so no visibility to the crater lake. This tour was fantastic - it was our first time in Costa Rica and thought that this may be a good overview to start out with. The experience exceeded all expectations. Mauricio, our tour guide, and Carlos, our driver were awesome. So friendly and informative - we learned so much and got to see some incredible sights. Everything advertised was met, from the volcano, to a delightful breakfast in a small village, to the ruins of Cartago to an amazing boat ride along the river followed by a fantastic lunch at a really cool lodge... I couldn't recommend this enough to anyone that may be seeking a great introduction to this wonderful country! Esta excursión definitivamente podría ser mejor planeada. La primera parte estuvo muy bien, pues el interés del guía era que vieramos el volcán sin la neblina, lo cual se logró. Pudimos haber estado mucho mas tiempo en este lugar que es hermoso, y la ciudad de Cartago supongo que tenía mas cosas que ofrecer. Sin embargo el tour continuaba muy muy lejos de ahi. Hicimos casi tres horas para llegar al paseo del río que francamente no pudimos disfrutar pues veníamos todos los del tour cansados. El tour del río esta bien, nada espectacular. Los dos lugares que nos llevaron para comer bastante malos y escasos. El regreso tomó otras tres horas. Sugiero que si quieren solo ver el volcán que es lo único que vale la pena de este tour lo tomen en otro paquete o vayan solo a ver eso y aprovechen quedarse más tiempo. Después del volcán, el guía no ofrecía mucha información a menos que alguien le preguntara.